There are two parts in a domain name; a top level domain and a second level domain. 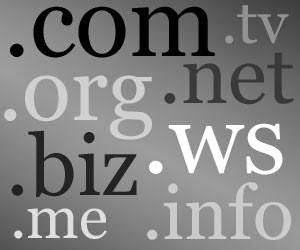 Second level domains are usually picked by an owner after registration if the name is available. For example in www.yahoo.com, ‘yahoo’ is the second level domain. Top level domains include .com (pronounced dot com), .net, and .org. some of these top level domains are restricted for use to specific organizations or even countries. For example, .gov is used by governments and .edu is mostly used by the schools. .US – This is an option for companies or businesses in the United States.
. EU – This is an option for companies and businesses in the EU.
. CO.UK – This is an option for businesses in the United Kingdom. There are also other types of domains which one may consider such as; .BIZ, .WS, .MOBI, .TV, and .INFO. A .COM domain is always recommended for companies and businesses; however one may find that their desired domain is already taken by someone else. In such a case, one can come up with the next best alternative name or try and purchase their desired domain from the current registrant. However, more often than not, purchasing the domain from an existing registrant may prove to be too costly. Keep the name short and easy to remember – A domain name should be short and easy to remember. Where your preferred name is already registered, try adding an extra relevant name at the end; for example if xyz Inc is a manufacturing company and xyz.co.ke is already taken, try xyzmanufacturing.co.ke or xyzinc.com. Do not use hyphenation in your domain name, this causes confusion and is not easy to remember. For example, xyzmanufacturing.co.ke is much easier to remember than x-y-zmanufacturing.co.ke.